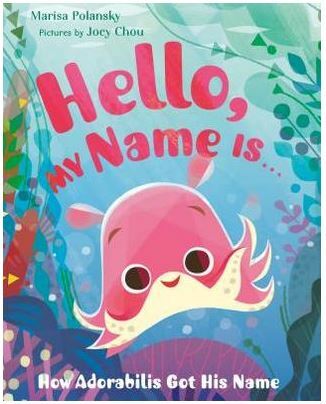 In Hello, My Name Is… we follow a cute pink creature as it searches for its name. Along the way, we meet several sea creatures and learn their common names and why they have them. After exploring the pink creature’s many attributes, we learn that it is Adorabilis, a type of flapjack octopus discovered in 2015 by researchers from the Monterey Bay Aquarium. The animals and scenery in the book are depicted with prominent angles, bright colors, and plenty of contrast. A picture of the actual adorabilis, a brief description of taxonomy, and the history of Opisthoteuthis adorabilis’ discovery and naming are included after the story. Verdict: This is an informative story about how organisms’ names often reflect their physical attributes or behavior. It would be a great addition to a lesson on sea life; but make sure students realize that some of the creatures in the story live in vastly different environments and would never encounter each other in the wild. October 2018 review by Lillian Curanzy. Have you wanted to be really good at something, but others seem to excel more than you? Jasmine’s class is having a talent show and she wants to perform, but she isn’t sure what talent she has that she can share on stage. Her mother used to play the taiko, a Japanese drum. When her mom played the drum, she felt free, strong and happy and feels that Jasmine may feel the same way. Maggie, a classmate brags about how good she is, which makes Jasmine feel bad about herself. In the end, Maggie messes up on stage and Jasmine is a success. Jasmine encourages Maggie and makes her feel good about herself. Jasmine’s mom encourages her to practice, and if she makes a mistake, to keep on going. Told from Jasmine’s point of view, this book is in the Jasmine Toguchi series, but can stand alone. It contains simple Japanese words and Japanese culture. Illustrations are simple line drawings that add interest to the story. The end of the book contains the Author’s note explaining the history of the taiko, a Japanese drum. It also includes instructions to make your own hachi-maki, a headband worn to catch sweat and keep it from running into one’s eyes. There is a short sneak peak of the next book in the series. 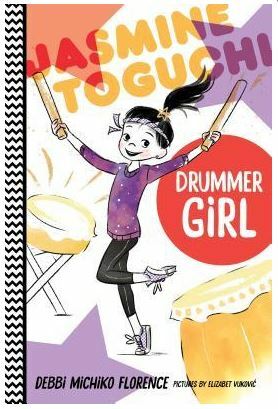 Verdict: Rich in Japanese culture, fun and relatable, this story encourages one to practice, not give up and to find out what talent they have. It also shows forgiveness and reaching out to others, even if the other person has not been kind. I highly recommend this book for elementary school and public libraries. May 2018 review by Tami Harris. 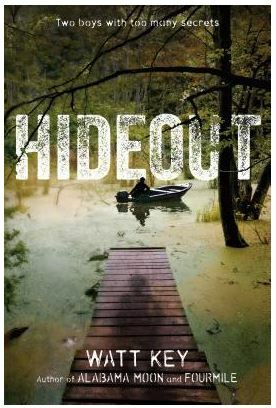 Hideout is a buddy adventure set in the mysterious swampy areas of the Gulf Coast. Sam’s new fishing boat has broadened his small world to include the very wild bayou that stretches for miles around his house. While exploring, Sam discovers a dilapidated hunting camp and, to his surprise, a very hungry boy named Davey attempting to inhabit one of the crumbling cabins. In his effort to help his new friend, while keeping it a secret from his family, Sam quickly realizes that Davey could be in serious trouble. Hideout is very much in line with Watt Key’s previous young adult novels. It features a male lead, takes place along the Gulf Shore, and discusses the complexities of family relationships. Young readers will enjoy the adventure and danger of Hideout. Male readers will relate to Sam and Davey’s sense of adventure and their views of what it means to be a brother. Verdict: Hideout is a suspenseful story that will keep young readers interested. It would be a popular edition to a school library. The target audience is young boys. There is mention of smoking and drug use and a description of a dead body. June 2017 review by Lillian Curanzy.